According to a 2009 report from the National Alliance for Caregiving and AARP, 65.7 million people (almost 29% of the U.S. population) served as unpaid family caregivers. This tremendous volunteer work force performs a service that in 2009 had an estimated monetary value of $450 billion and an incalculable value in love, effort and personal connectivity. 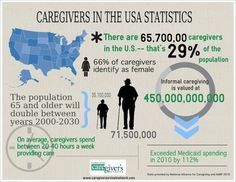 Those 65.7 million people spent an average of 20.4 hours per week on caregiving duties; for those who live with the people for whom they provide care, there’s a dramatic increase in the number of caregiving hours, to 39.3 hours per week. In other words, caregiving is essentially the equivalent of a full-time job for those who live with their patients – something many caregivers know but which the data fully backs up. With so much time devoted to caregiving, it naturally raises the question of what kind of impact this may have on the health of the caregiver. The 2009 National Alliance for Caregiving report found that 17% of caregivers reported their health as “fair” or “poor,” as opposed to 13% of people who are not caregivers; that number goes up to 23% for those who have been caregiving for 5 years or more. Moreover, the report found that among caregivers living with the people for whom they care, 25% listed their health as fair or poor. When asked if they felt that caregiving had an impact on their own health, 74% felt there was no impact, while 17% felt their health worsened and 8% believed it had gotten better. Of those caring for patients with emotional or mental health issues (which includes dementia), the percentage believing their own health had declined raised to 28%. The amount of time spent caregiving also impacts health; 29% of those with 21 or more weekly hours of caregiving noticed a negative impact on their own health. Yet there can be health benefits for caregivers as well. A retrospective study published in the Journal of Social Work Education in 2008 reported that people in supportive situations for their spouses, such as many caregivers, had lower five-year mortality rates. In addition, caregivers reported that caregiving had a positive impact on their mental outlook. Among people who find that caregiving has improved their own health, it’s possible that one factor may be that keeping track of another person’s health can help one keep track of one’s own health. A Pew Center study from 2013 states that “caregivers are highly engaged in the pursuit of health information, support, care, and advice, both online and offline, and do many health-related activities at higher levels than non-caregivers.” This study also reports that 72% of caregivers keep track of at least one of the following factors: weight, diet, exercise routine, blood pressure, blood sugar, sleep patterns, headaches or other health indicators. By contrast, among non-caregivers, that figure is only 63%. Further, among those caregivers who keep track of their own health, 52% say that this tracking has affected their overall approach to maintaining health, 50% say it has led them to ask a doctor new questions or seek a second opinion and 44% say it has affected a decision about treatment. In other words, in many cases caregivers have gained useful experience through caregiving which they are able to apply in ways that has a positive impact on their own health. Maintaining personal health is crucial for family caregivers. Working with one of the excellent HomeHero staff is one way to attain this goal. HomeHero staff can provide assistance that keeps the family caregiver from feeling overburdened and many of the suggestions that they make for maintaining a senior’s care can also be applied to family members providing care.